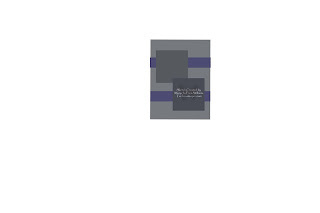 Want a Sneak Peek of things to come??? It's Out Of Here! A Grand Slam! 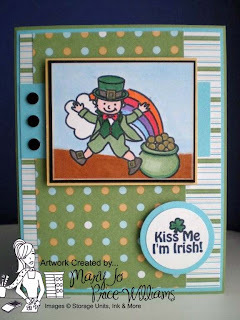 Faux Mosaic and a leprechaun too! Couple of Challenges and give away reminder! Fun with the Top Note die! Blogger's Challenge 81 and a GIVE AWAY too! Another Challenge-Whachadoin' want to play? Sketch 50 Players-- Check them out! It's your birthday so party hearty! I'm Nuts About You! and My New Assignment too! Happy Mother's Day a little early. 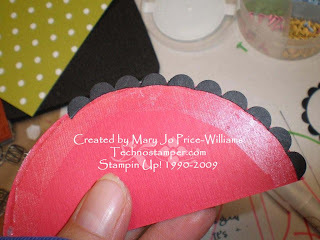 More Your Hired and sketch challenge review--all Stampin Up! I have three more in the series for you today! The first one is using sketch number 5 and the new set A Kind Word. 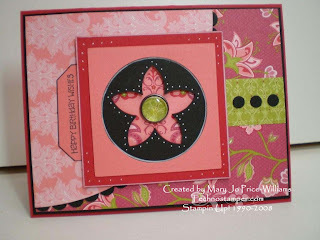 Again here is the original sketch..
And finally sketch number 7 and the new Flower Burst sizzix embosslet! Thanks for stopping by today! See ya soon. 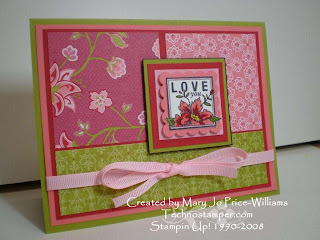 The first card is a Valentine using the new scallop oval frame die! The elephant is popped up for dimension. 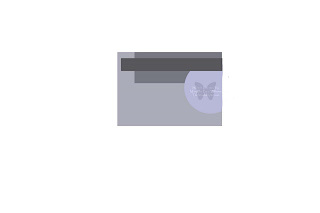 This is card number 4 in the Your Hired Series. 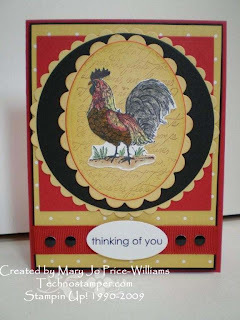 Other: markers, scallop oval frame die, tag punch, two sided satin ribbon, red brad. Next is card number 5 in the Your Hired series. 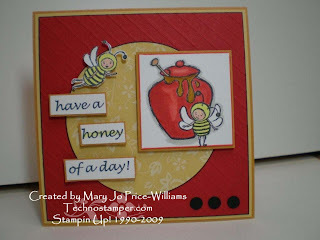 It is also using my first ever sketch challenge which is shown right below the card. 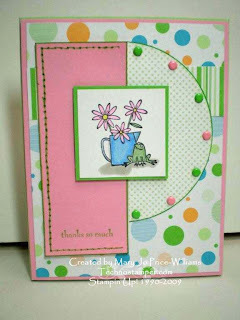 This next card is my Technostamper sketch number 2 -- card number 6 in the Your Hired series and Card number 1 for the Blogger's challenge. 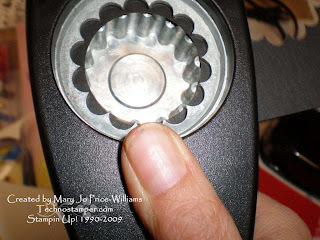 Other: hand held circle punch, five petal flower punch, ticket corner punch, sm circle punch, 1 1/2 circle punch, scallop circle punch, white gel pen, build a brad. 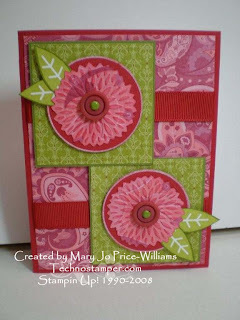 This next card is my Technostamper sketch number 3 -- card number 7 in the Your Hired series and Card number 2 for the Blogger's challenge. 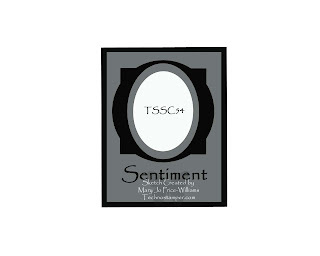 And finally this card is for the Limited Supply Challenge on SCS today -- Clean and Simple Cards and it is also card number 8 in the Your Hired Series and was done using Technostamper Sketch challenge number 4.
here is the original sketch..
Yikes! That was a long long post--hope you enjoyed it. Let me know what you think--I love comments. 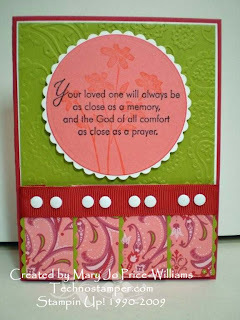 See ya soon--now I got to go make more cards since I just showed you ALL the new ones, lol! Remember you can see the other Blogger's Challenge and Your Hired players by clicking the links on my sidebar! 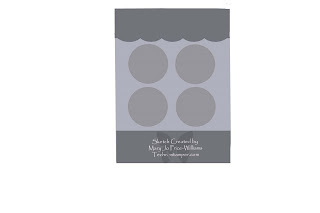 Shhh, it is not my day for sneak peeks but when I read this challenge (WT203 use alcohol) this was the first thing that came to mind so I hurried and made it and I am now "sneaking" it on here, lol. 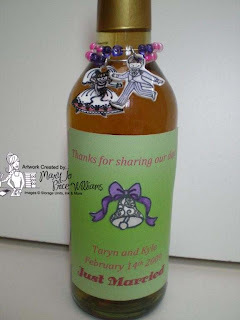 This is a small bottle of wine with a custom label that can be used as a wedding favor with two wine glass charms on it. This is the Goin' to the Chapel set that will be released on Feb. 1st from Storage Units Ink and More. I have lots to share soon, I had a visit from the UPS guy today! 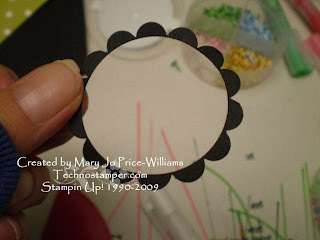 New Stampin Up! stuff, I made 6 cards today! On February 1st Storage Units Ink and More will be releasing two brand new sets. Both sets are just adorable and I am having so much fun with them. Today is day one of the sneak peeks so I bring you a card and matching tee shirt (ala-my son the model). 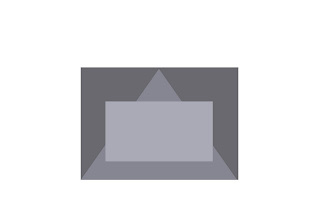 If you click on the image you will be able to see the shirt better. And here is the matching card. I used the SC213 on SCS for the layout. Be sure to check out all the rest of the sneak peeks --here is a schedule so you don't miss any! Off to get some stuff done. Be back soon. 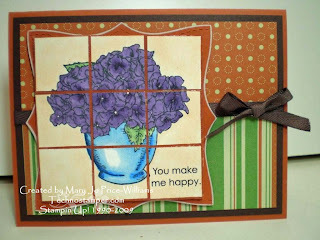 For Tuesday's color challenge on SCS--garden green, baja breeze and pacific point. Quite the combo! I will be back in a bit with my Sneak Peek for Storage Units Ink and More! So cute! Accessories: cuttlebug, nestabilities, scor pal, wide ribbon, faux brads, small scallop blade for cutter. I am not really sure I like this set. I am not much of a Rooster person but thought it was something different. What do you think? Yes, you like it --No it is not my style???? Want to play along? I would love to have ya join in. 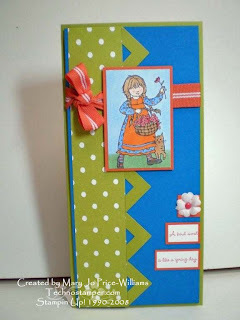 All you have to do is create a card using the sketch and then come on back here and leave a link on Mister Linky to the direct post. Can't wait to see what you come up with. Here they are and they are all wonderful so be sure to check them out if you have not already! Thanks so much for playing ladies. Next one is on its way, a bit early but I am really tired. 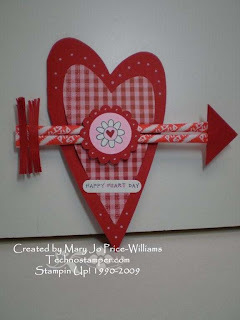 This challenge was to create a heart shaped card, with candy attached. Also it needs to be all current SU! Here is what I came up with. It was hard to get a good picture because of the distance needed. It was a fun challenge though. In keeping with the theme of yesterday's post -- the triple play, today is a Grand Slam! This post is covering 5 challenges! First up, is the color challenge card. These colors are so fun. The Kiwi looks great with the black and or the Red! Next up is the make up for last week's same but different challenge. I used the same layout and the same stamp set! What a different feel, huh? 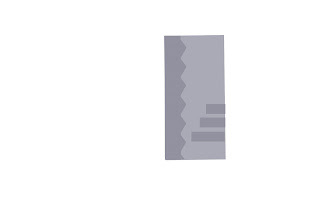 Now for the mini tutorial on the scallop edge on the first card. 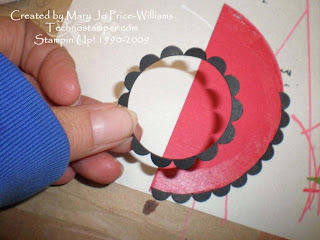 Next you will use your scallop circle punch and by looking at the bottom you will line it up so that you will get a very thin scallop circle frame. See below. After punching you will have this. See below. Now you just need to snip it between scallops and attach to whatever you want the scallop on. This will also work on a straight edge, but of course we already have a punch for that! These do make a smaller scallop though. See below for how I attach. I just run my adhesive around the edge and the attach. It's not that I don't appreciate them or that I am not honored by them, it really is that I have a hard time picking names of people to pass it on to. 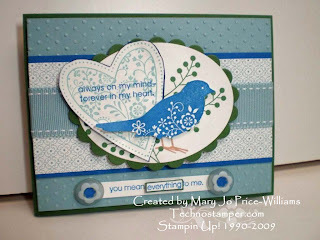 There are SO many talented stampers out there that I have a hard time picking. But the reality is that I should be thanking these wonderful people who honor me. So here we go.. This first one is from Barb from Made for Keeps. 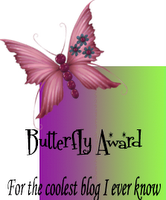 This one is pretty cool, it is to thank people who encourage you and leave comments for you. We all love to hear that you like what we are doing so this one is great! Thank you Barb. This next one is from Karen at Krafting with Karen. This is so sweet, thank you so much Karen! This next one is such a beautiful graphic--don't you think? 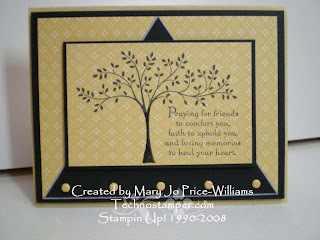 This one was sent my way by Patty at Pepper's Papercrafting. Thanks so much Patty, I am truly honored. Again thanks so much Carolyn, I am sincerely honored. This image would make a great stamp, huh? It feels like I am missing a few--so please please please let me know if you left one and I did not acknowledge it. So since you have four links already to check out I am leaving it at that. 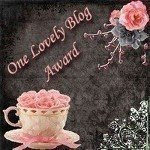 But please do check them out, each of these ladies have fabulous blogs--well worth the effort. And remember to give them a little love too--in the form of a comment. We all love those. 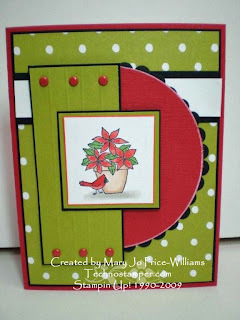 This card is for three different challenges, first it is the SC212 on SCS, and the SUINKWWC 24 inspiration challenge, and then today's WT202 pattern pizazz challenge too. 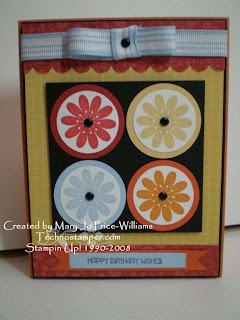 I added the words to the striped dp, embossed and added dots in matching colors to the strip dp. Fun challenges- all three of them. 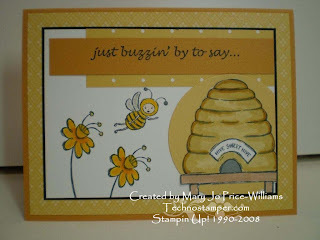 I love this new set- Just Buzzin By-- I could not wait to make a card with it. This will be the first card for my new assignment. You guys remember me telling you that I was just hired as a as a "Creative Deisnger" for the month of January by Sherrill Graff! 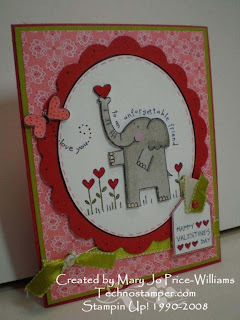 She is paying me to create cards for her using ALL Stampin Up! products. 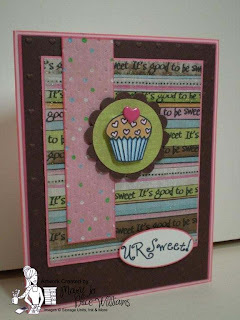 So during the month following our new catalog release you will see at least 50 or more cards using ALL Stampin Up stuff! So be ready. 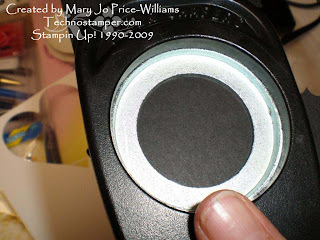 The best part is there there are others that were hired with me so they will all be posting the same amounts of Stampin Up cards for your viewing/casing pleasure! 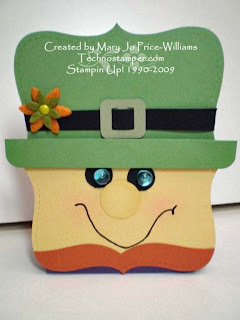 Here are the other talented Stampin Up! demonstrators that I will be privileged enough to be working with. Be sure to check out their blogs-- they ROCK! I will be adding them to my sidebar soon. For the Technique Lovers Challenge on SCS. Faux Mosaic. And then as I was looking at the scraps of Really Rust card stock left over from the Top Note die I thought the scrap piece looked like a beard so that is where this lucky little guy came from. His eyes are pretty freaky IMO! Hope you have a fabulous day.